Protection and rights of victims are a very important issue for the Saxon police. Victims and relatives can find useful information, offers and hints here. Generally any victim can contact any police officer. There are contact officers at any police station and there is a central coordinating point at the Saxon State Office of Criminal Investigation in Dresden. If you become a victim of a crime, it is useful to know what happens next. You can find some main information here. We are especially interested in informing you what happens in a court room during a possible trial but moreover it is our particular concern to support and encourage the victims to get in contact with additional and further support and assistance. This brochure is aimed at people who became a victim of a crime and is handed over by police officers. 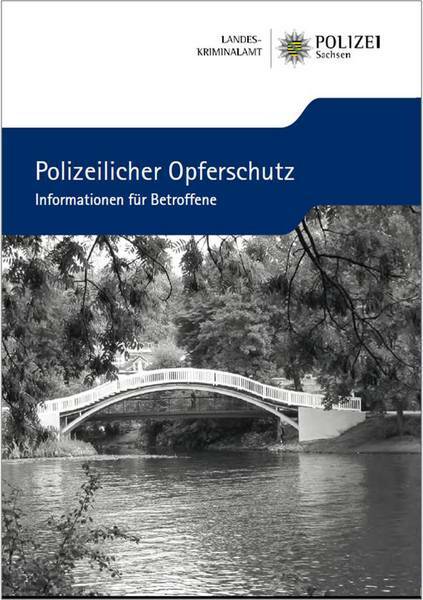 Apart from information about specific offences the brochure contains facts about the course of the criminal proceedings and the victim`s rights as well as comprehensive address lists offering support options for the victim. We do not raise any claim to be complete. In fact we would like to encourage you to bring that kind of support you need.